Engineering field test 35 years ago, John Hiniker-decal story, M-4064-L- truck. The Forty Series, Part 2; The International Harvester Electrall; The 4 Faces of the 140; Jack Holland's IH Electrall Does It All! The #8 Little Genius Plow; Youngest Farmer; One Hundred Years of the Reaper; McCormick Deering Orchard & Grove Tractor; Engine Reference Guide. An International Golf Legend; The Case that made a President; The Elliots and Their IH Side; The Plow Shop; 40 Series, Part 3; 240 Series Service Info. McCormick Is Back; From Grey to Red; More IH Myths; The Tribute M; Grandpa's Tractor; Some Bits and Pieces; How To Get The Most Out Of Your IH Archives. IH Red for Christmas; The Elwood Manufactures; Grandpa's C; European RPRU Review; Exploring Africa; The IH Story of Prototype Dealerships; The Red Carpet Special; Rooted in IH Tradition. Hydromechanical Transmission; Sparks Restoration; The IH Power House V-8; Four Generations Celebrate The Cub Cadet; Pick a Bale of Cotton; IH 40 Series - Part 4. F/460 By the Numbers; Family of Cub Cadets; The 10-20 Mogul; What's in a Name - Plenty; A Dream Tractor; An IH for Everybody; Am I Getting the Right Part; Final Drive Failures of the IH 5-Speed Tractors. Guy Fay, IH Enthusiast and Author; F-12 - The Early Years; An IH Combine for Pay; California Dreaming, Part 3; Alhambra's IH Man; High Horsepower Farming; JP's 1st Annual Midwest Cub- A-Rama; 560 Series - By the Numbers; My Cub Cadet; Garrett Twin-Drive Update. How Scoop Shovels Killed the grain Binder; Major Changes in the F-30; California Dreaming, Part 4; Tractor Tales; Memories of a Family Farmall B; A Late Summer Windfall; IH, An Education; Power Units - By the Numbers; South of the Border - Original Beauty in a 1066. It's Back! The Farmall Name Returns; Was Louisville Profitable?The Keister Collection; Cherish Yesterday - Dream of Tomorrow - Live Today; The New 3X88 Series IH 2+2; Growing Up With IH;The Original (Cub Cadet) Hydros! ; 240 Series - By the Numbers;The Family Tractor. Tall Tractors; IH in Wood! ; Cadet Connections; Graduation Requirements; Farm Boy Turns Artist; The Number ONE; Project 766 Helps Bury the Ashes; A Slice of IH American Pie; Earl Buettner, a Sublette Regular. SOLD OUT!! Pneumatic Lift-All; The Sugar Bush Express; Still Skidding;Persistance Pays Off For Chapter 17; IH Advertisers Postersand IH History; Birth of An Original; Wagner Little Giant; TheJohnson's Collecting Together; T-6 and T-9 By THe Numbers;From Farming to Collecting. Letter Series Tractor Intro-1939; New Farmall Tractors Arriving in Iowa; Family Fun (Siple's W-4 and W-6); Sorensen's IH Museum; Casselton Collection (J Moderow); IH Hydrostatic Drive Tractor, Part 1; The Iron Mule (V Merchant); Punxsutawney Collector (T Rake); Model 100 Spreader Restoration; Y and W Pages (Prototype Cub Cadet #409); The Winning Ticket - (B Hnetkovsky's Demo C). This Issue Features the Fast-Hitch; Story of the Center of Population: IH Hydrostatic Drive Farm Tractor, Part 2: Fast-Hitch Friends (M Peters); One Point Fast-Hitch; Fast-Hitch; Taking Aim at the M (C McLaughlin); Hot Time in Cool Florida (IH Winter Convention). Powering the Chopper (J Puckett); IH Spring Roundup at Auburn; Touch Control Hydraulics; Dave Tipps IH Ties; Restoring "Beatle's" Farmall A (D Eden); An Eye for the Unusual (J Graber Collection); Red Fever (Savage); Parade or Field-Ready (W Thede); Pushing Planes - Refurbished Pay Movers. The Whole Heritage Thing; Searching for Grandpa's 1206; Pleasant Days in Mount Pleasant; Fabricated F-20; The The Experimental M That Escaped the Scrap Yard; 1206 Tractors by the Numbers; The Moldboard Plow; Changing Season - Farmall Grow's America. Dan Hoffman's 1927 McCormick Deering 15-30; Bill Carroll Gambles on Wheatlands; International E-270 Pay Scraper; Big-country Tractors; Big, Small, & Everything in Between; K.R. Withrow's Big Standards; Mammoser's W-450 Restoration; What Does the "W" Mean? ; Cub-Arama 2004. After the John Manny Reaper Trial; Life After Logging; Together Again - Consecutive 1954 Super H's Reunite; Farmalls and Vegetables; International's TD-15; Making Tracks - Couple Collects Crawlers; Meet Bonnie Nelson; Orion's Tractor Finds a Home. In the Trenches - Old Cub and Auburn Trencher; Son and Father Collectors - Mendrala; Power Units; A Cubette Story; Red Baby - Speed Truck Toy; High Times Southern Style - RPRU; 16th RPRU Wind Up. International Model 65 Pay Hauler; Making Corn King; Cultivators in the Corn Field; IH Bookmobile; Richard Cleer's 806 & IH Heritage. A Mostly Working Collection; IH Pleasures Overseas; Development of the Cotton Picker - Part 2; Plow Days; Harvester's Hydraulic Excavator; Beautiful Binders - Thayer Collection. Used But Good - Kelly Collection; A Cub For Dad; The Culti-Vision Farmalls; McCormick-Deering 0-12; Greetings from Mars - 2006 Winter Convention; Industrial Artwork; Everybody Loves a Scout. IHC Steel Tractor Wheels-Part I; A Super M - With M & W OptionsMakeover; Did IH Sell Mom & Pop A Kettle? ; Potato Machines;George Loque’s IH Walk; Putting Out Fires; The New Red-GoldTractors; Red Power Round Up; IH Innovation Has Made It To Space! Price Lists; IHCC National Consignment Auction; IH Eagle Series Trucks; Bubba Ehrig’s Farmall Gold Demonstrator; Andy and Lori Kamp’s IH 856; Toymaker Gets Top Honors; So...You Want to Start an IH Dealership? Rear Mounted Blades; Miniature McCormick-Deering 10-20; Thomure Manufacturing; Jerry Kuster’s IH Museum; The IH Fire Tractor; Lynn Huyear an IH Fan! Hay Rakes; A Milestone Tractor; C.A.S.S...Another IH Computer Idea; Dad’s 756 and its Red Power Reunion; One Era Ends, Another Begins; Farmall Acres - A Museum Created by Harold Metternich Jr.; Saving Farmall Red from the Junk Pile! 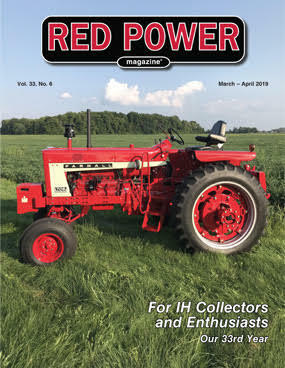 Red Power Roundup; Red Power Roundup Collage; IH 686 Tractor; Pennsylvania Memories; A Queen and a Farmall Story; IH and Cotton; Richland FFA's Super C is Super! ; Herrs Memory Lane; Serial Numbers. Back issues are $5.00 each, postpaid. 5 or more issues are $4.50 each, postpaid. Canada back issues $8.00 each, postpaid. Foreign countries, $13.00 each, postpaid (US funds). For your convenience, we now accept credit card payments!